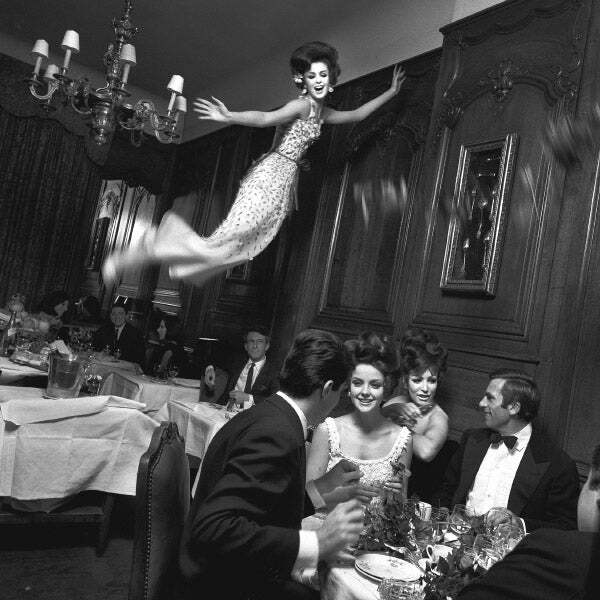 In the early 1960s, the photographer captured elegant models soaring through the air and floating in bubbles over Paris and New York. Now, we reveal the secrets behind his magical compositions. Photographer Melvin Sokolsky has always defied convention. Like his peers Irving Penn and Richard Avedon, Sokolsky dreamed the impossible and helped revolutionize the art of fashion photography during the heady 1960s. The achievements of Penn and Avedon are, of course, legion: Penn brought exquisitely composed still images of impeccable fashion to a new level, and Avedon introduced the spirited freedom and sensual mood of an on-location fashion shoot. Sokolsky, meanwhile, had a derring-do of an entirely different sort. With unparalleled technical ingenuity, he was able to translate his flights of fancy into enduring images that transcend fashion. Sokolsky insisted that female beauty and the gesture of the model herself were just as important as the clothing she wore. 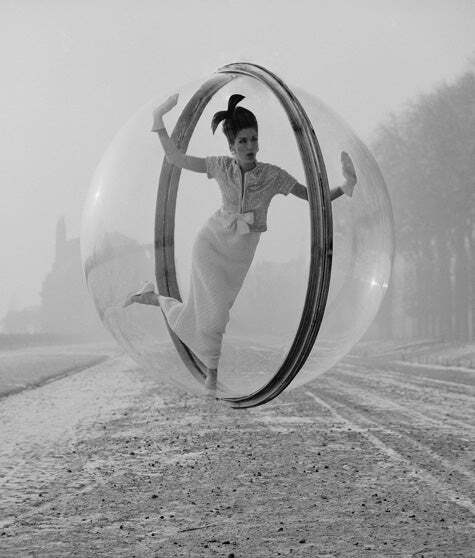 At the time, this was a radical concept, and he pushed the idea to the limit in his groundbreaking 1963 “Bubble” series for Harper’s Bazaar, in which models donning elegant couture were suspended in a Plexiglas bubble over Paris. 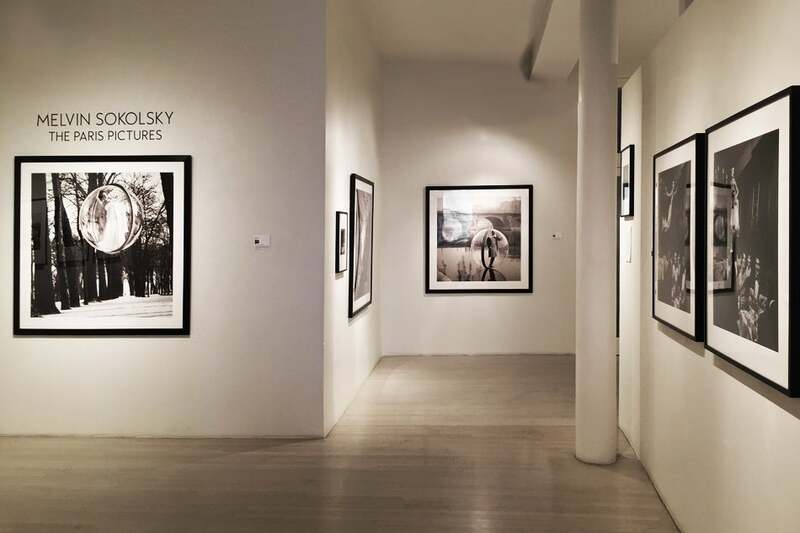 That series has now come to New York’s Staley-Wise Gallery as part of “The Paris Pictures.” On display through April 16, the show includes signed prints ranging from On the Seine, Paris, 1963, in which a fetching couture-clad model skims over the river in a bubble, to Sokolsky, Make Dalí Fly, Paris, 1965, a group of contact sheets showing Salvador Dalí visiting Sokolsky’s set in Paris. Raised on Manhattan’s Lower East Side and self-trained in photography, Sokolsky was tapped by Bazaar art director Henry Wolf, for the plum assignment to shoot the 1963 Paris fashion collections. Dubbed “the kid” by Bazaar’s editors, Sokolsky had been recruited by the magazine, known for stretching artistic boundaries, at the precocious age of 21. 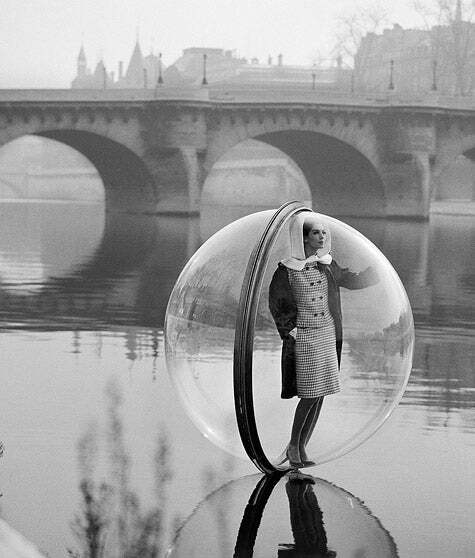 His proposition was considered radical, if not bonkers: He would put “It” model Simone d’Aillencourt inside a giant bubble of his construction, which would flirt with the waters of the Seine and the rooftops of Paris. “It took a gutsy guy to say to a publication, ‘I’ll deliver a fantasy of my dream,’ ” observes Staley-Wise co-owner Taki Wise. 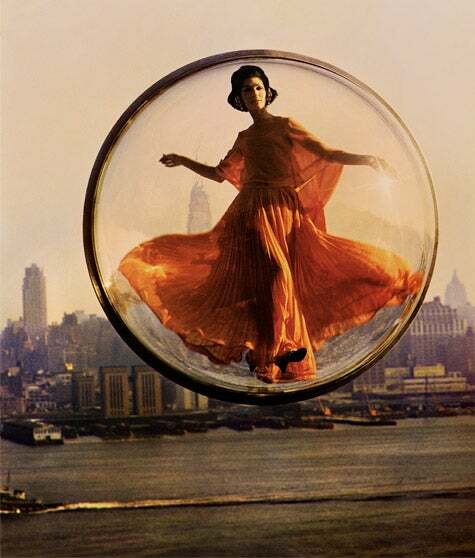 “ ‘And I’ll make a girl fly in a bubble.’ ” The notion — which Sokolsky sketched on a napkin to show to his crew, after getting the green light from Bazaar’s top aesthetic arbiters, including fashion editor Diana Vreeland — had been hibernating in his mind since childhood, when he saw Hieronymous Bosch’s depiction of a naked couple in a bubble in The Garden of Earthly Delights. The fantasy seemed like a possibility after Soloksky encountered huge Champagne-inspired plastic bubbles in a Christmas window display at the B. Altman department store on Manhattan’s Fifth Avenue, he tells Introspective. The 1960s were, of course, a time of weightless freedom: space-age designs by André Courrèges and Pierre Cardin, London rocking to the aesthetic beat of the mod movement. But there was no such thing as Photoshop or computer-generated imagery, so Sokolsky’s proposal was a massive undertaking. 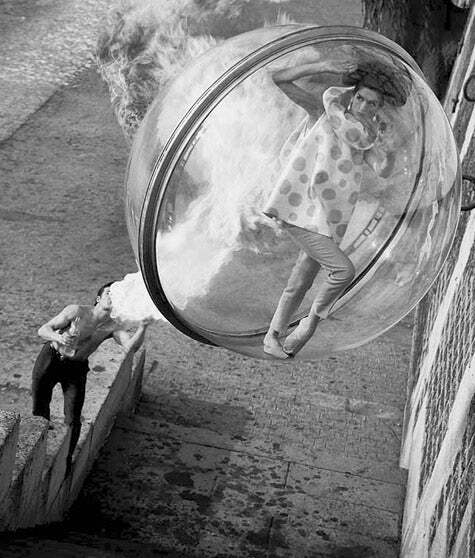 He had to build the Plexiglas bubble and suspend it from a crane and cable in precarious locales throughout Paris. The project would involve dozens of workers, including his young assistant and stylist, Ali MacGraw, whom Vreeland referred to simply as “girl,” Soloksky recalls. Staff photographer Avedon was incredulous at the idea, saying “the kid will never get the thing off the ground,” Sokolsky remembers. To prove that the cable was strong enough to lift a 120-pound model in the bubble, Sokolsky had an assistant drive a Volkswagen into the studio and dangle the car from the wire. The bubble was hinged and outfitted with a latch, he adds, which the model could unlock by pulling a cord in case of danger. When his work appeared in Bazaar, it caused a stir. There was the element of surprise, asking readers to suspend their disbelief while also manifesting one of Vreeland’s famous dicta: to show women “what they don’t know they want.” Who wouldn’t desire to float around Paris in a Christian Dior ensemble? If fashion is fantasy, Sokolsky grasped the reader’s imagination in a manner never before seen. Consider the model wearing a black-lace, white-piqué Jean Patou dress in a bubble next to the fierce stone lions of Paris’s Pont Alexandre III. Or the contemplative woman in the double-breasted, black-and-white-check Philippe Venet suit walking on water, like Jesus on the Seine. “The Paris Pictures” also contains behind-the-scenes documentation. 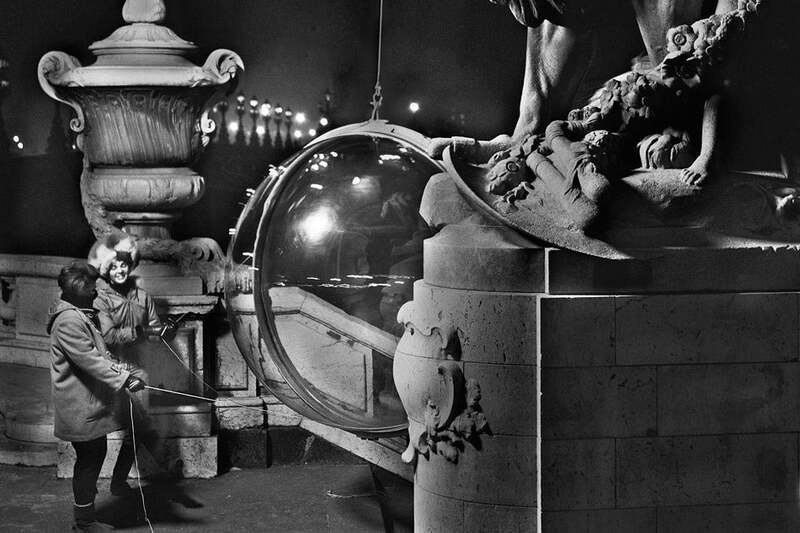 Here, studio assistant and stylist Ali MacGraw (in a furry hat, before she became a famous actress) and Paris Bazaar editor Marion Capron stabilize Sokolsky’s Plexiglas bubble during a 1963 shoot on Pont Alexandre III, in Paris. 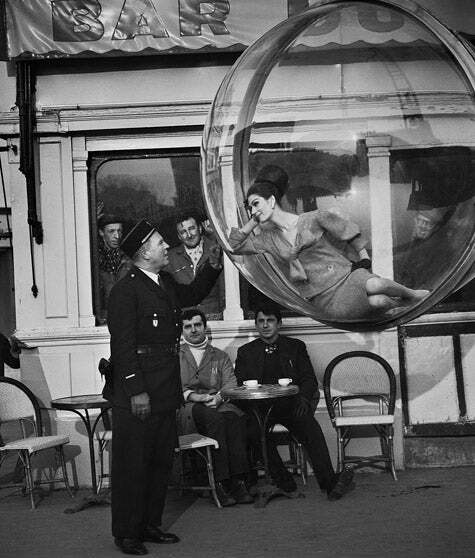 The people who made the Paris “Bubble” compositions possible include (left to right) a taxi driver, studio manager Eli Pollack, crane operator Michel, model Simone d’Aillencourt, Sokolsky, his brother Stanley Sokolsky, MacGraw, fellow photographer Isi Veleris and crane operator Guy. 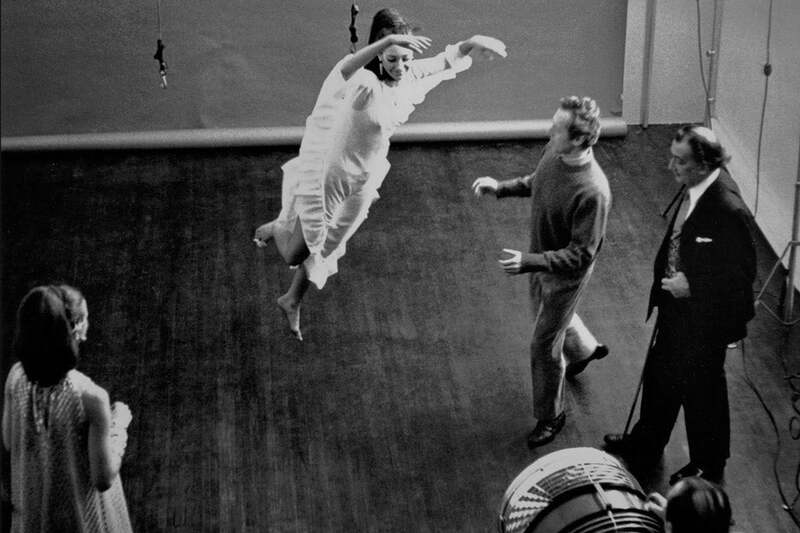 Marisa Berenson lifts off during a 1965 demonstration of the harness that Sokolsky developed for his “Fly” series. The model on the far left is Agneta Darin, and on the right is surrealist master Salvador Dalí, who had heard that Sokolsky could “make you fly” and went to the studio to find out how. The exhibition remains on display at Staley-Wise through April 16. Sokolsky’s technical mastery didn’t end there. 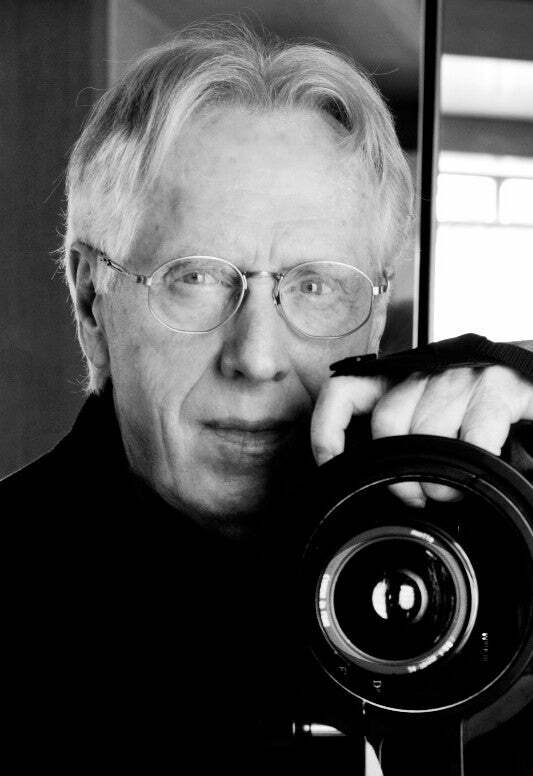 He designed a computerized zoom lens that director Francis Ford Coppola and cinematographer Gordon Willis used in the filming of The Godfather. 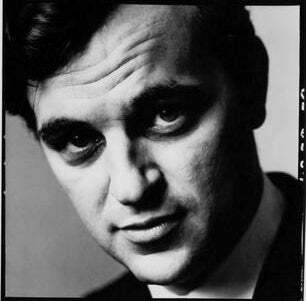 In L.A., he became a highly successful director of television commercials, receiving countless Clio Awards over the years. The recent nostalgia for all things ’60s has no doubt buoyed Sokolsky’s reception among the current fashion flock. Not that he needs further approval. His work has been exhibited at the Louvre, in Paris, and is in the permanent collection of the Victoria and Albert, in London. His revolutionary vision forever places his work in the pantheon of unforgettable photography. “If a picture transcends fashion, transcends the dress they’re wearing or how the person is posing, it becomes iconic in some way,” Sokolsky once said. “It makes you think about the world around you.” Spoken like a true icon. Over the course of her career, the late, great 20th-century photographer Lillian Bassman created captivating black-and-white images whose painterly, abstracted quality all but reinvented the medium of fashion photography. At New York's Staley-Wise Gallery, an expansive two-part exhibition celebrates the career of iconic photographer Bert Stern, featuring selections from his breakout ad campaigns and celebrity portraits of such stars as Marilyn Monroe and Marlon Brando, as well as screenings, film clips and exclusive documentary footage.